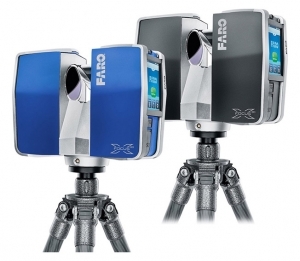 In many sectors, 3D laser scanning is the standard for capturing the exact ‘as-built’ situation. With the help of a 3D laser scan, any environment can be presented in 3D at lightning speed and down to the smallest details. The use of laser scanning is often applied when making modifications. Often, there is limited survey time to measure everything, complex-shaped objects are involved or the environment to be measured is unclear, dangerous and difficult to reach (due to heat or gas). Laser scanning is also the best way to collect 3D data if construction problems, such as deformations or misalignments arise, or when 3D data needs to be reused for future purpose. A 3D laser scan is a distance measurement performed using a laser scanner; an optical instrument that projects a pulsating laser beam on an object. When the laser beam is reflected back, it is captured by the scanner. The scanner collects up to 2 million points per second. Because the 3D laser scanner cannot see through objects, we make scans from multiple positions to obtain a complete 3D image. During the post-processing phase, the individual scans are combined with the help of software into a complete 3D point cloud. The result is a complete and accurate representation of the object or environment. In addition to the scans, the scanner can also produce a full 360-degree colour photo from any position. The photos are used to colorize the point cloud and are used in online applications such as our WebshareCloud environment. After delivery, the point cloud is available for further 3D engineering in systems such as PDMS/E3D, Revit, Autocad, Navisworks and many more. unlocking ‘as built’ data via cloud solutions. At Smart AIS, we look at the full picture of the customer’s needs. All of our colleagues have a technical background and know what’s going on, what the customer really needs and where certain problems may exist. We think along with our customers and can provide short- and long-term advice. For example, we tell them how a scan can be reused for other purposes or we show customers what they can do with scans in the future. Technical developments happen fast. At Smart AIS, we are focused on optimising our approach. We encourage innovation and strategic collaboration. We are flexible. We try to answer questions or requests directly and convert this into action for the customer. Through our extensive experience and expertise, our focus is on relieving customers. Meeting the customer’s expectations as closely as possible is our main priority. You can also combine scanning with our other services, such as our Asset@Your Desk service. This opens up a world of digital information opportunities to you. Your own ICT systems and programs can be linked to Asset@Your Desk, making all of your information available centrally.